On Sunday, the Japanese Aerospace Exploration Agency (JAXA) is planning to bring the Hayabusa probe down to Earth in Australia, hopefully bringing bits of an asteroid down with it. 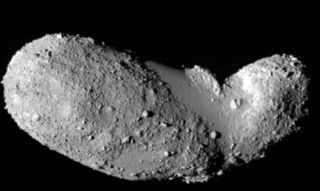 The probe visited asteroid 25143 Itokawa in 2005 and attempted to collect samples of dust and pebbles from the rock. Because of glitches during the sample collection, scientists are unsure exactly what they will find when they open Hayabusa's sealed sampling chamber. But if successful, this will mark the first time asteroid samples are returned to Earth for analysis. 1. They will tell us about the origins of our solar system. deputy principal investigator on NASA's Dawn mission, which lifted off in 2007 and will visit asteroid Vesta in 2011 and dwarf planet Ceres in 2015. Because of the position of the asteroid belt that lies between the rocky inner planets and the gas giants of the outer solar system, the materials found there may hold clues as to why the planets are so diverse today. For example, although Ceres and Vesta formed at roughly the same time ? within the first 10 million years of the solar system's existence ? they have very different compositions now. Vesta, at some point, melted completely and then resolidified, so it is now smooth. Meanwhile Ceres does not show signs of having gone through this melting. It's possible, Raymond said, that Vesta experienced more collisions, or that it had a high amount of a radioactive form of aluminum that would have given off heat as it underwent radioactive decay. By studying each asteroid, scientists will be able to solve this mystery. ? ?2. They will help us understand more about the origin of life. Scientists do not fully understand how the first life forms arose on Earth from non-living organic matter, and asteroids may help us learn more about this puzzle. Asteroids such as 2 Pallas and 10 Hygiea, which are both believed to have had water in the past, appear to have organic (carbon-based) compounds on them, Raymond said. Today, these asteroids have a more primitive chemical composition than Earth has ? they are more similar to the conditions that existed in the solar system's younger years. By studying them, we may learn about how life arose on our own planet. "There are conditions that may have been conducive to life in the past," Raymond said. Plus, scientists think asteroids that landed on Earth long ago may have deposited some of the building blocks that helped start life here. 3. We may want to mine near-earth asteroids for metals. "There is a keen interest in going to asteroids in the near-earth belt," Raymond said. "They could be sources of valuable metals." To investigate the feasibility of such operations, we need to know more about asteroid composition and the technical aspects of traveling to them. Besides the opportunity for mining, these asteroids are also interesting from a scientific perspective, because studying them complements our studies of the major planets, Raymond said. Analyzing the differences between the planets and the smaller asteroids is like taking slices of the solar system at different times during its formation. 4. They may someday threaten to collide with Earth. Because some asteroids orbit around the sun in paths shaped like elongated ovals, they cross Earth's orbit every so often. And sometimes, they come very close to Earth itself. For example, in January, asteroid 2010 AL30 passed within about 80,000 miles (130,000 km) of Earth. But 2010 AL30 was just at 36 feet (11 meters) wide. More worrisome is the prediction that asteroid Apophis will come very close to Earth on April 13, 2036. Although NASA predicts that it will pass no closer than 18,300 miles above Earth's surface, Apophis is larger than two football fields. While that's not big enough to create Hollywood-style global devastation, it could cause significant regional damage, were it ever to strike Earth. 5. Astronauts may go visit one, according to Obama's new plan for NASA. In April, President Barack Obama announced the next goal for Americans in space: visiting an asteroid by 2025. In a panel discussion in April, astrophysicist John Grunsfeld ? a former NASA astronaut who flew on five shuttle missions ? suggested that one goal might be sending humans to purposely move an asteroid, to nudge the space rock to change its trajectory. Such a feat, he said, would show that humanity could deflect a space rock if one threatened to crash into the planet. "By going to a near-Earth object, an asteroid, and perhaps even modifying its trajectory slightly, we would demonstrate a hallmark in human history," Grunsfeld said. "The first time humans showed that we can make better decisions than the dinosaurs made 65 million years ago."